The Texans' offense received a big boost with the return of Arian Foster to the lineup. 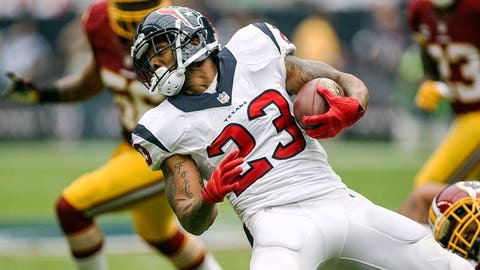 After missing the first three weeks of the regular season recovering from groin surgery, Houston Texans running back Arian Foster made his season debut in Sunday’s 48-21 loss to the Atlanta Falcons. Foster was involved early, catching a 15-yard pass from quarterback Ryan Mallett on Houston’s first play from scrimmage. He followed that up with runs of two and three yards on the next two plays. The 29-year-old finished the day with eight carries for 10 yards to go along with thre receptions for 25 yards. He also fumbled once, after teammate Derek Newton inadvertently stripped the ball from in the second quarter. Atlanta cornerback Desmond Trufant picked up the ball and returned in 24 yards for a touchdown. The Pro Bowl running back underwent surgery Aug. 7 after tearing his groin early in training camp.